This is the second recipe I made as part of this year’s March Madness Tournament, hosted by 365 Days of Slow Cooking. Unlike the Tomatillo Cream Cheese Enchiladas, I was really looking forward to this recipe. Let’s face it—I like tacos. Pretty much any kind, actually. I had never cooked with tomatillos before (and rarely cooked with any other pepper besides bell peppers), so I was excited to try something new. Honestly, though, this recipe really disappointed me. I was worried that the chicken would end up being too spicy, or maybe I just wouldn’t like the flavors of the peppers because I had never really had them before. That wasn’t the case at all—in fact, it was actually pretty bland. We were planning on having leftovers for dinner later in the week, but I’m going to plan to use them in another dish instead, because I really have no desire to eat these tacos again. But! Karen from 365 Days of Slow Cooking gave this recipe 5 stars, so it’s definitely not a bad recipe. Everyone has different tastes, of course. Maybe I’m just finding out that I don’t really like tomatillos. If you read through the list of ingredients and think that this is something you would like, I encourage you to give it a try. So, which recipe won this round? If you had asked me what my prediction was before I made either recipe, I would have told you these tacos, hands down. However, I was proven wrong. 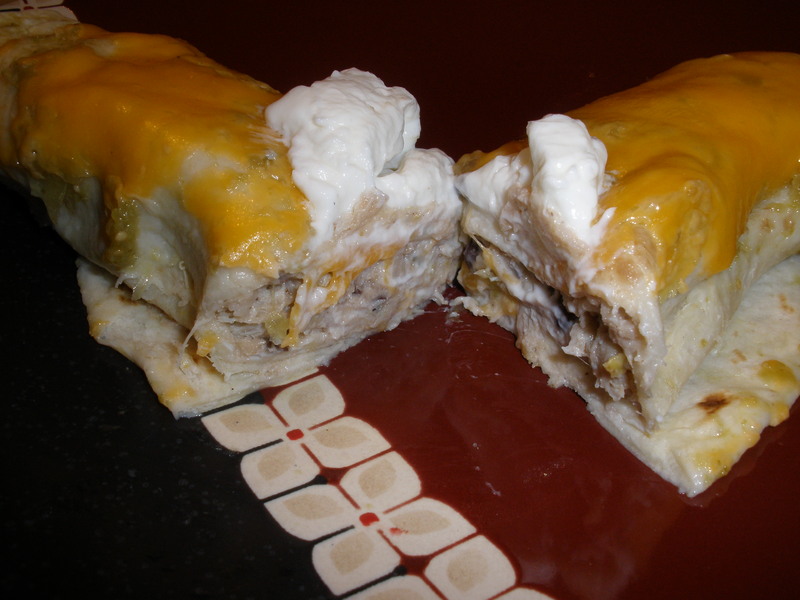 The winner is the Tomatillo Cream Cheese Enchiladas! Place chicken in your crockpot. Add the onion, chiles, garlic, oregano, and cumin, stirring to combine. Add in the tomatillos. Cook on low for 6–8 hours. At end of cook time, remove chicken and shred. Strain the liquid from the slow cooker into a bowl. Puree the strained solids in a blender (or use an immersion blender). Add puree and the chicken back into your crockpot and stir well. Add more cumin, salt, and pepper to taste, as well as 2 tsp. lime juice. If needed, add in some of the strained liquid. 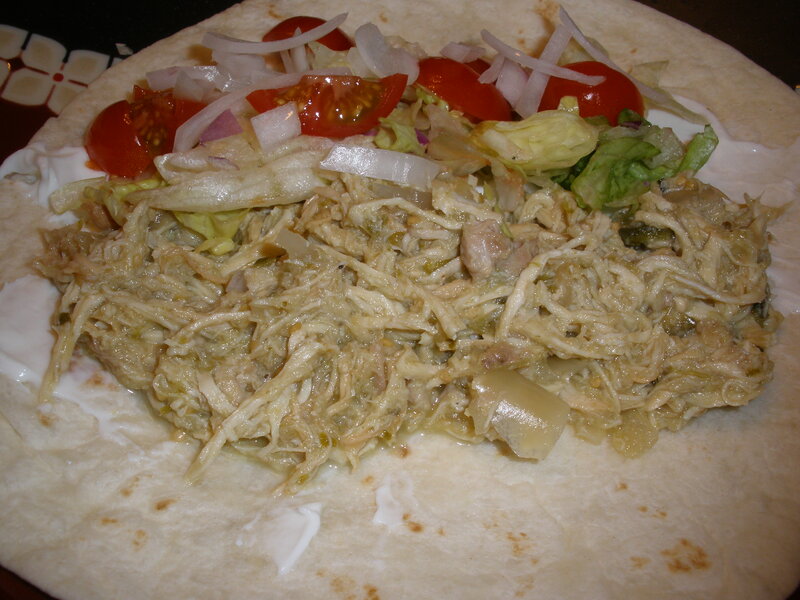 Serve wrapped up in tortillas with sour cream, cilantro, lettuce, cheese, tomatoes and other toppings of your choice. Or as an alternative, serve atop a nice salad. Find more meal planning ideas at Menu Plan Monday. I’m participating in the Slow Cooker March Madness Tournament again this year! Last year, I participated in two rounds of the tournament and had a lot of fun. My first match-up was between Chicken Cordon Bleu and Creamy Corn Chowder in Round 1 of the tournament. For Round 3, Zuppa Toscana was matched up against Cafe Rio Chicken. From participating in this contest, I discovered four fantastic dishes that I might not have chosen to make on my own. I’m hoping that happens this time around as well! This year, I chose among recipes that were already paired in duos. These Tomatillo Cream Cheese Enchiladas will take on Tomatillo Chicken Tacos. Check back next week for the winner! Right off the bat, I wasn’t necessarily looking forward to this recipe. Even coming from me, the girl who loves her crockpot, a crockpot enchilada recipe seems counterproductive. You still have to do all the work in rolling the enchiladas, so there’s no shortcut there, and not to mention the fact that the cook time is 2 hours on high. With working full time, I get the best use out of my crockpot during the work week when I can set something on low for 8 hours and come home to a nice dinner that’s ready and waiting. With a recipe that only cooks for 2 hours, that forces me to make this recipe on the weekend. It’s just not feasible to come home after work, prepare the enchiladas, and then wait 2 hours to actually eat them. In that case, I might as well bake them. With that being said, this dish was really good. As Rick said, he was “pleasantly surprised.” He feared that the enchiladas would be soggy, but that was not the case at all! This recipe would be great in the crockpot on those hot summer days when you don’t want to heat up your oven. I’ll definitely plan on making these enchiladas again, even if that means baking them in the oven instead. In a bowl, combine the chicken, beans, cream of chicken soup, cream cheese, garlic powder, cumin, lime juice, salt and pepper. Stir until well incorporated. Use about 1/3 cup of filling and spoon down the middle of each tortilla. 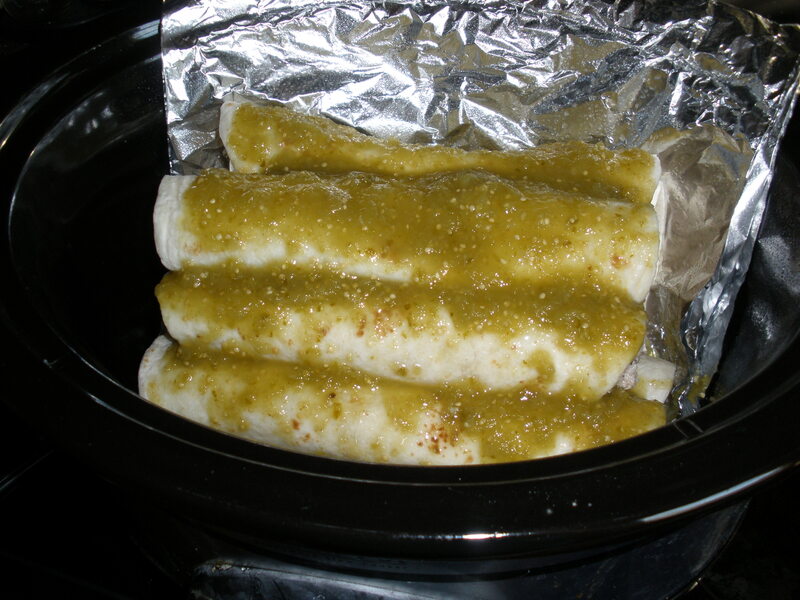 Roll up and place in the bottom of a large crockpot that has been sprayed heavily with non-stick cooking spray. You’ll have to place some on top of others to make it all fit. 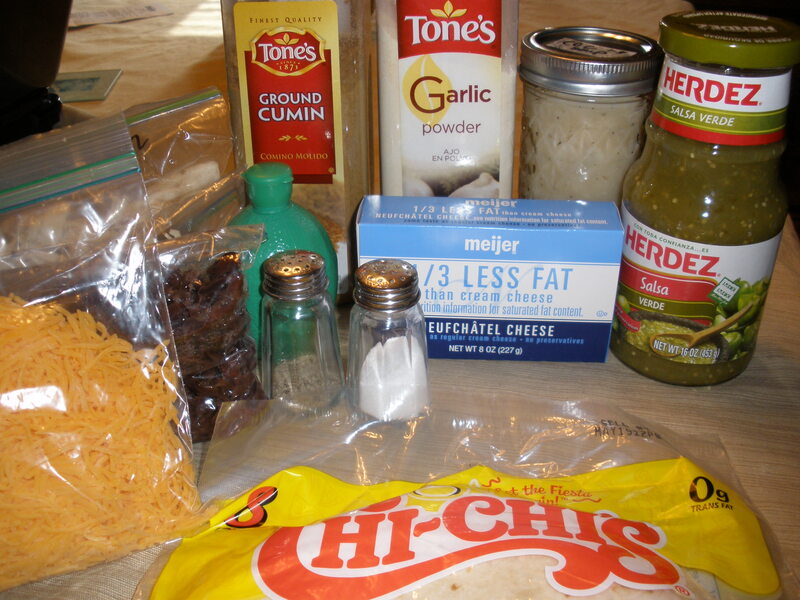 Pour jar of salsa on top of the enchiladas. Cook on high for about 2 hours. When there is about 15 minutes left, sprinkle the cheese over the top and let melt. Serve with sour cream and garnish with lime and cilantro. Note: The back side of your crockpot (side opposite of the controls) typically cooks much hotter. Use a foil collar to make sure the enchiladas on that side don’t get burned. How to make a foil collar: Layer and fold sheets of heavy duty foil until you have a six layered foil rectangle. Press the collar into the back side of the slow cooker insert; the food will help hold the collar in place during cooking. 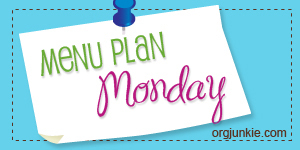 Find more menu ideas at Menu Plan Mondays. So it’s Friday afternoon, right before I leave work for the day, and I’ve decided that ya know — I really deserve something special tonight. I’m going to make a dessert of some sort! I rarely bake anything. I know some people love to bake, but for me, it’s not really my thing. It’s not relaxing or me in any sense of the word, plus (and a big plus) is that I would gain a ton of weight if I baked more often. I struggle with my weight enough as it is, so I don’t need those added goodies in the house all the time. But on Friday, I had convinced myself that I deserved something. 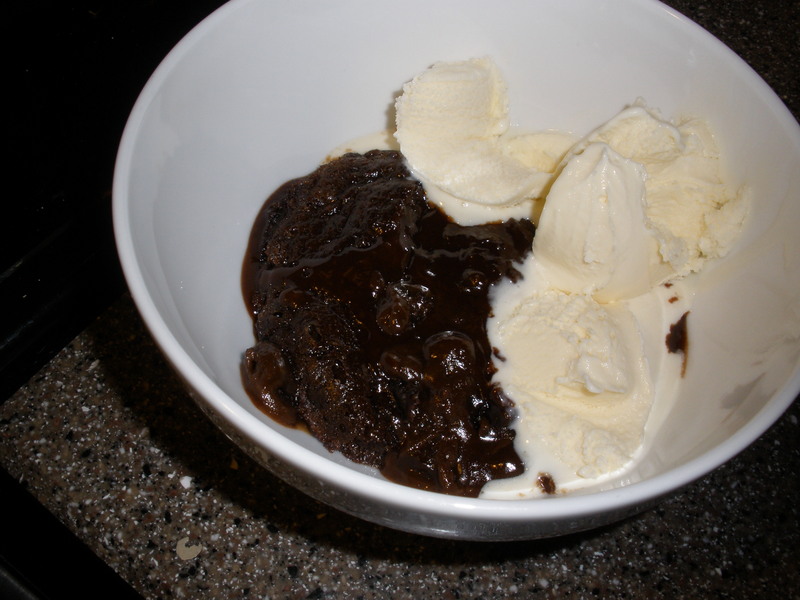 With my 2012 challenge in mind, I thought it would be a great time to make a dessert in the crockpot (a category on my blog that is seriously lacking). I remembered that I had save this chocolate cobbler recipe from Eat at Home Cooks, and thought it would be the perfect night to make it. I rushed home after work and got this in the crockpot asap. It was ready about 3 hours later, and was the perfect treat to end the week! I used a 3 1/2 qt. crockpot. Spray the inside of the crockpot with cooking spray. In a large bowl, stir together flour, baking powder, salt, 3 tbs. cocoa and 3/4 cup white sugar. Stir milk, melted butter and vanilla into the flour mixture until smooth. Then, pour into the greased crockpot. 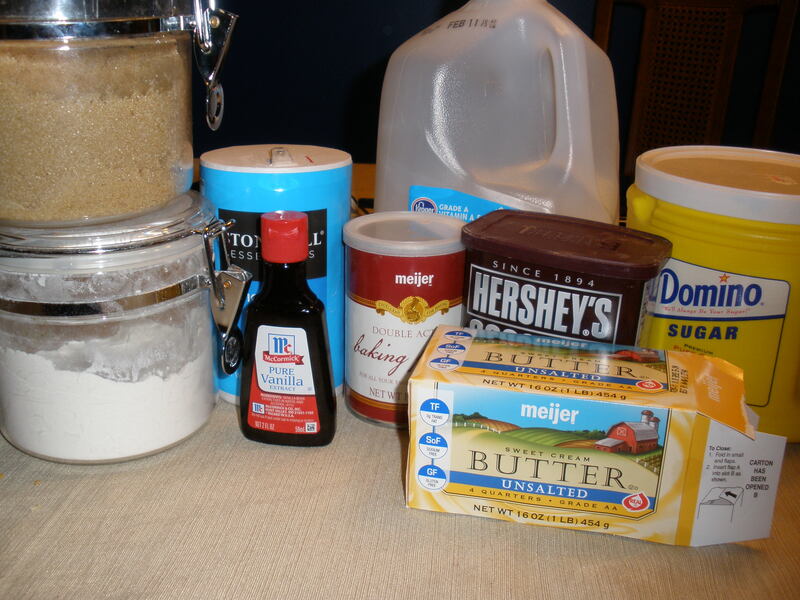 In a small bowl, combine 1/2 cup white sugar, brown sugar, and cocoa. Sprinkle over the top of the batter in the crock. Pour hot water over the top. Do not stir! Cook on low for 3-4 hours. Remove the lid and let stand for several minutes before serving. Eat at Home Cooks says that at first, it might be a bit too liquidy, but should thicken up after several minutes. I didn’t seem to have this issue when I made mine. Serve with vanilla ice cream and enjoy! 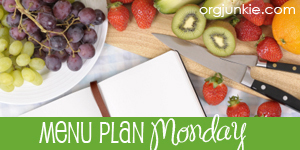 Find more menu ideas at Menu Plan Monday. Ahh, Pinterest. What a wonderful and fabulous way to waste time. But, really, it’s not all bad. Because of Pinterest, I discovered a new cooking blog that I’ve grown to love: Plain Chicken. I don’t remember the first recipe I’ve saved from this blog, but there have been a lot. One of them was this Crockpot Jambalaya. 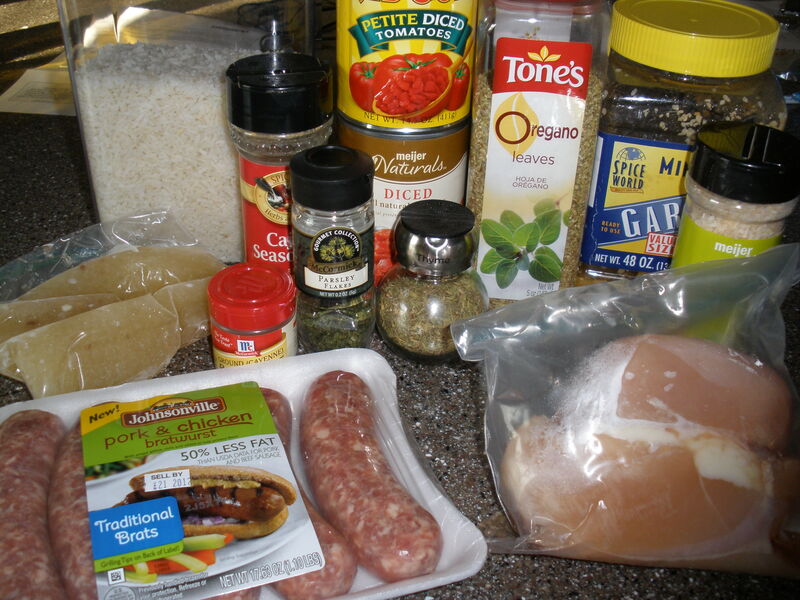 For this recipe, I used Johnsonville Pork and Chicken Brats. I think one mistake I made with this recipe was simply adding the brats to the crockpot and letting them cook there. Next time, I’ll cook the brats separately (or at least brown them first, and then add them to the crockpot) so that the brats maintain some of their original flavor. Now, I must warn you, it tastes better than it looks (I just could not seem to get a good picture of this dish!). This dish was very filling, very flavorful, and had just the right amount of spiciness. This would be great to serve for a large crowd. I can’t wait to make it again with the changes I noted above. 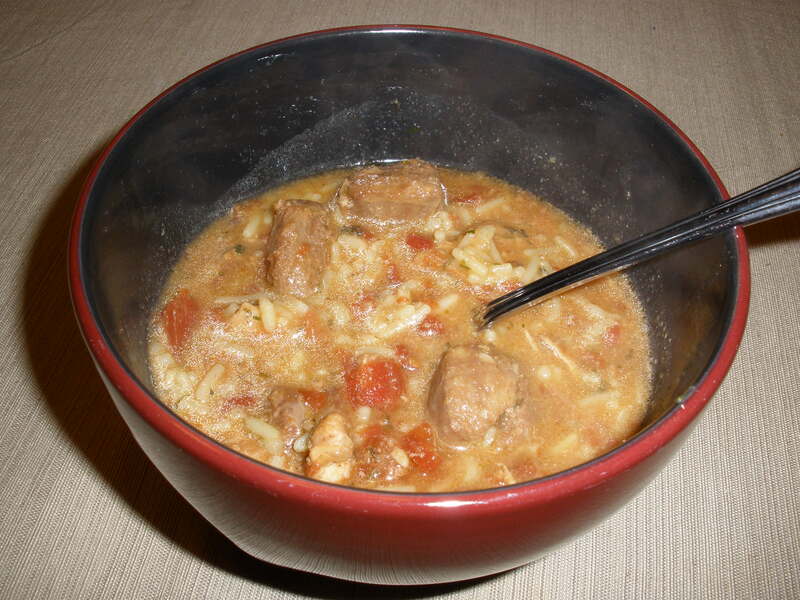 Mix the chicken, sausage, tomatoes, onion, garlic, and broth in your crockpot. Season with oregano, parsley, Cajun seasoning, cayenne pepper, and thyme. Stir well. Cook 7 to 8 hours on low, or 3 to 4 hours on high. Mix in cooked rice and cook for about 15 minutes until warm. Serve with cornbread muffins and enjoy!